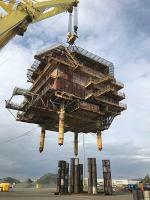 Veolia and Peterson have accepted the first offshore structure into their Great Yarmouth decommissioning facility. The Shell Leman BH platform accommodation block arrived into the harbour on 11 July and the 50-metre-high steel jacket structure that supported the topside is due to follow later in July. The topside, which was previously used as living quarters for personnel working on the Leman BT and Leman BK platforms, has now come to its new home to be recycled.